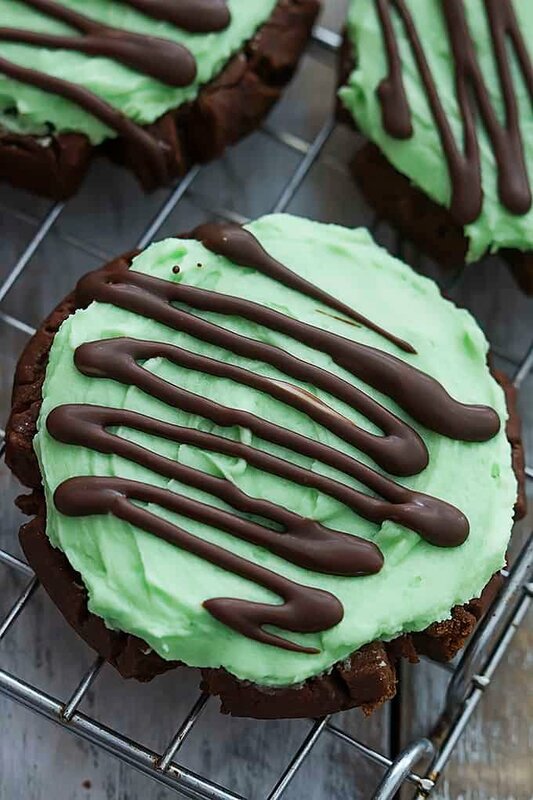 Moist and thick chocolate Grasshopper Sugar Cookies covered in fluffy mint frosting and topped with a rich mint-chocolate drizzle! 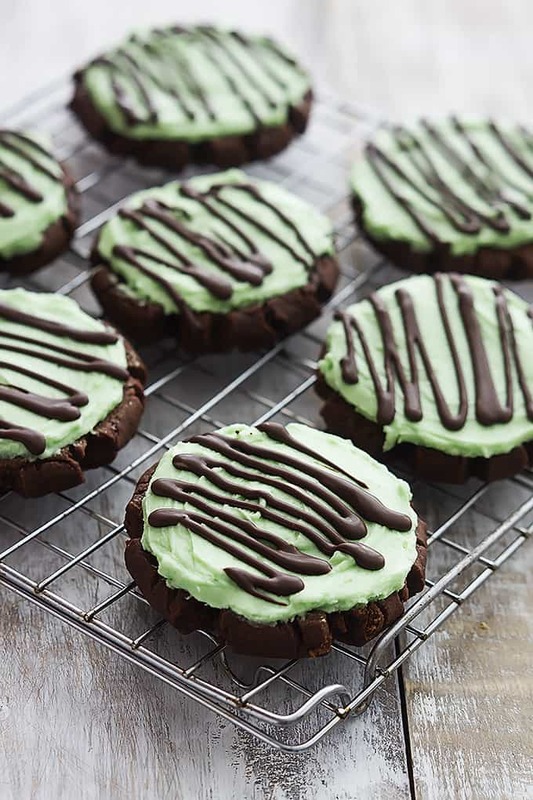 Calling all mint-chocolate lovers! Your day is about to be made my friends. My husband is a huge mint-chocolate fan. As much as he loves chocolate (and he does, ohhhh he does) he loves it even more if it’s got something minty going on. Starlight mint ice cream is his favorite and he goes nuts for the thin mint girl scout cookies. Or grasshopper cookies, as other brands call them. Which is basically the inspiration for these cookies. Not basically. It is the inspiration. Let’s give credit where it’s due shall we? Plus it’s kind of obvious since these are named grasshopper sugar cookies and all. Annnnnyway. These beauties are made with my all-time favorite sugar cookie dough base with a few tweaks to turn it into the perfect chocolate sugar cookie. Next you’re gonna top it with a whole-lotta super fluffy mint frosting. And last but not least?? The mint chocolate drizzle. Just look at it – so purrrrrdy. The really cool thing? It is created from all of one ingredient. One. The oh-so-popular Andes mint chocolate candies. My gosh I love those things. Just unwrap a handful of those, melt them in the microwave, and drizzle that goodness right on top of your cookies. And if you didn’t already know, they also make Andes mint chocolate “chips”. They’re basically crushed Andes and you can find them in some stores near the regular chocolate chips. Those work perfectly for this. Now have yourself a cookie. You deserve it. 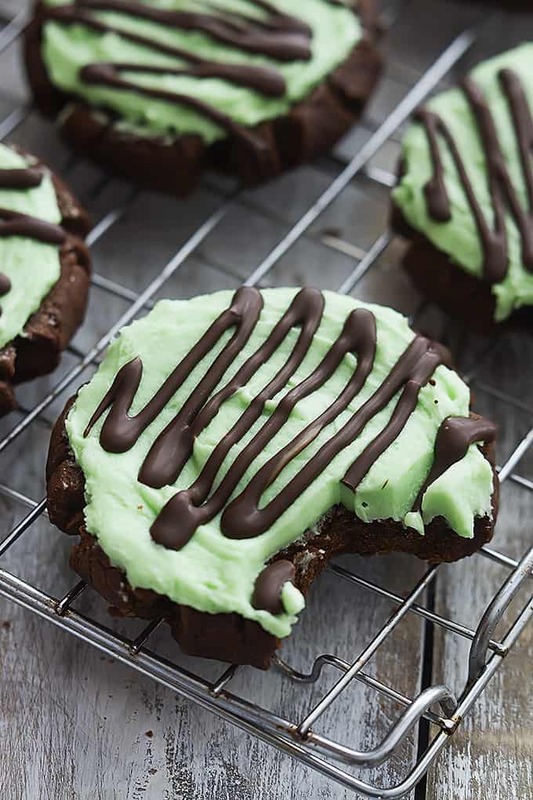 Easy Grasshopper Sugar Cookies are moist and thick chocolate sugar cookies covered in fluffy mint frosting and topped with a rich mint-chocolate drizzle! In a large bowl cream together butter, vegetable oil, 1 1/2 cups sugar, powdered sugar, water, eggs, and vanilla. In a medium bowl whisk together flour, cocoa powder, baking soda, cream of tartar, and salt. Add dry ingredients to wet ingredients and mix until combined. Cover [i]tightly[/i] with plastic wrap and chill for 30 minutes. Uncover the dough. Place remaining 1/4 cup sugar on a small plate. Grease a large baking sheet (you'll need a couple if you have them). Roll dough into balls, slightly larger than a golf ball, and place on baking sheet 3-4 inches apart. Use the bottom end of a tall glass cup (or the bottom of a small jar) for pressing the cookies. Spritz the bottom of the glass/jar with cooking spray then dip the bottom into the sugar. Press cookies to about 1/2 inch thickness. Let the edges of the cookie dough squish out about 1/4 inch past the edges of the glass. Bake at 350 for 8-10 minutes. (they should still be slightly undercooked) Allow to cool for at least 10 minutes on the baking sheet before transferring to a cooking rack. Baking the remaining cookie dough in batches until you've used all of the dough. While the cookies are baking or cooling, prepare the frosting. Cream the butter for 3 minutes until very light and fluffy (do not cheat, do it for the full 3 minutes). Add the powdered sugar one cup at a time until desired consistency and sweetness is reached. (I used about 4 cups of powdered sugar) Mix in the mint extract. Taste, and add powdered sugar or mint extract as desired (I used the amounts listed). Mix in green food coloring if desired. Store covered in the fridge until ready to use. Place cookies (as many as you can fit) on a baking sheet. Frost those cookies. 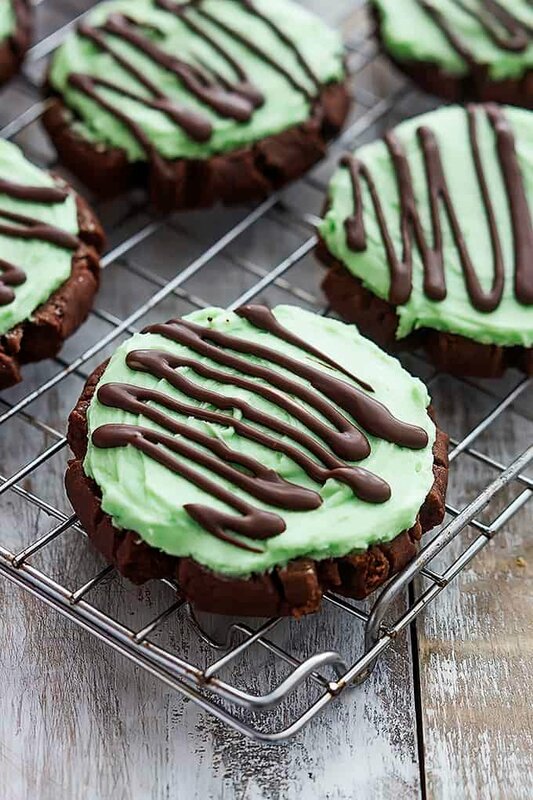 Next, drizzle the cookies with the melted Andes mint chocolate candies. Place the baking sheet in the freezer for 3-4 minutes, or in the fridge for 4-6 minutes until chocolate cools completely. You should now be able to place your frosted cookies in a large tupperware, stacking them with sheets of wax paper or parchment paper to separate each layer of cookies. Repeat with remaining cookies. Cover the tupperware and store in the fridge until ready to serve. About 10-15 minutes before serving take them out and let them sit at room temperature. More Sugar Cookie Recipes you'll love! I would love to make these but I’m curious about the “wet” to “dry” ingredient ratio. This recipe looks exactly like your Twigg sugar cookie recipe PLUS 1 cup cocoa powder. You don’t need to increase “wet” ingredients? I find cocoa powder can be very drying to baked goods……just wondering if it really does not make a difference. Great! Thanks for your response! 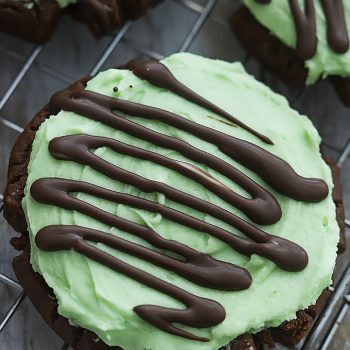 I’ll be making these for St.Patrick’s day, my two boys will love them! Um, yes, yes, and more yes! Can’t wait to try these! I love chocolate and mint! I will definitely be trying these! These look PERFECT. Bookmarking for a sweets-themed girls night we’re having next week! My only question is – how many does this recipe make? The proportions look super big but I couldn’t see the yield anywhere. Let me know if I’m missing it! really!? mine made 4-5 dozen!! with plenty of frosting so don’t skimp! 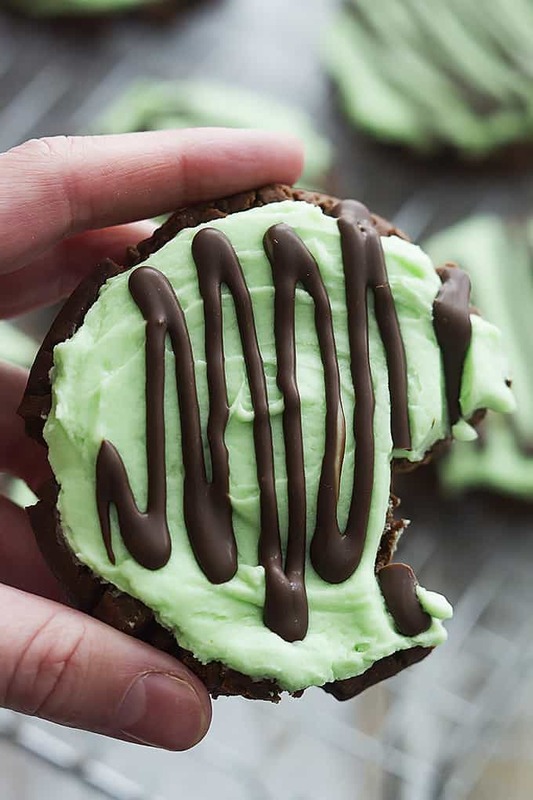 Made these for my office for a pre-St Pat’s day celebration and were a huge hit! The cookie isn’t too sweet so it balances out the icing jusssst right. I love the shade of coloring just 4 drops of food coloring creates. Thank you for sharing! OH MY these are absolute perfection. Have searched long and hard for a chocolate sugar cookie that is crispy on the outside and chewy on the inside. These are amazing!!! Just made them for my son – home from college – these may mean more visits!!! Made 36 HUGE cookies. Iced half with the grasshopper icing and the other half with a peanut butter frosting with dark chocolate drizzle. Both were a big hit. Will be using this recipe in my annual Christmas Cookie Weekend with my girlfriends that has been going on for about 25 years – they will flip!! Hi Shelly, I usually get about 30 from this recipe! Do you have a similar vanilla cookie recipe (one w/o cocoa)? Yes! Search “twigg sugar cookies” on my blog! These sound awesome! I’m wondering how they would be with the Andes chips in the cookie dough and no frosting…for the lazy among us and to avoid needing to refrigerate. Can I freeze the cookies? Yes- you can do that! Just make sure they are in an air tight container! Hi there. I am interested in trying This recipe, my only question is bullet 4. Where you place the remaining sugar on a small plate, but I dont See anything about what to Do With The remaining sugar. Thank You!